» Watch for sheep dressed in oil cloth. They can be slippery. Watch for sheep dressed in oil cloth. They can be slippery. That’s what proposals for carbon tax can sometimes feel like. 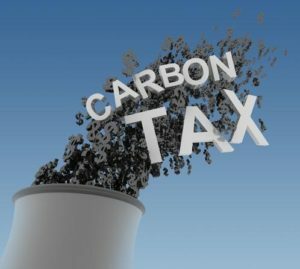 The basics of a carbon tax are a per-ton tax on the carbon dioxide emissions generated by fossil fuels or other products. Other greenhouse gases, like methane, are often included by converting their emissions into a carbon dioxide equivalent, or CO2e. Depending on its details, a carbon tax can offer many benefits for moving us all away from consumption of fossil fuels. In some respects it offers more than a cap and trade system of pricing fossil fuels, as a carbon tax is simpler, often with fewer escape clauses, and it can be collected by existing taxing regimes and resources. But there is the key question of what to do with the revenue generated by the tax. Many if not most proponents argue for a revenue-neutral regime where the tax collected goes back to consumers of energy resources who have to pay higher prices for energy. Environmentalists often argue to use at least part of the tax funds for the development and deployment of renewable resources, with the expectation this will reduce costs of energy. What needs to be watched is what else is proposed as part of a carbon tax plan. What are the trade-offs for the fossil fuel industry supporting any carbon tax plan? For example, in the US, a carbon tax plan has recently been proposed by former Republican Senator Trent Lott (Mississippi) and former Democratic Senator John Breaux (Louisiana), two well-known lobbyists for the fossil fuel industry from oil-rich states. The plan is endorsed by Exxon Mobil and Shell and others. The cast of characters behind the plan should raise alarm bells. At first it seems like false alarms. The proposal would result in higher energy costs, but all revenue from the tax would be returned to the public, with a family of four, for example, receiving a check for $2,000 every year. And everybody would have the incentive to reduce the use of carbon fossil fuels. Here come the alarms. In exchange for the support of the fossil fuel industry, and its lobbyists and political supporters, the plan requires that Obama’s Clean Power Plan, allowing EPA to regulate carbon emissions, is repealed. In effect, current and future EPAs could not regulate carbon emissions. Trump is currently attempting to accomplish this through regulatory undoing but his potential success is questionable. 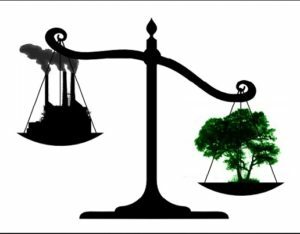 The carbon tax plan also provides that the fossil fuel companies get immunity from any lawsuits attempting to hold them accountable for any damage they have done to the climate. This provision is a bonanza as there are more and more lawsuits against fossil fuel companies seeking damages for carbon emissions that are causing climate change impacts, e.g., more severe extreme weather events, rising sea levels, heat waves. Here is the unspoken scenario under which such a deal could work wonders for fossil fuel companies. They agree to have a price set on carbon emission, say at $40 per ton as proposed, and in exchange they get the Clean Power Plan repealed, and immunity from lawsuits for what they have done to the climate with their fossil fuels. Then after the deal is struck and implemented, the fossilists spend a fortune lobbying a future Congress to reduce the carbon tax to say $5 a ton, which the industry will hardly notice and which will most certainly not result in the reduction of use of fossil fuels. Meanwhile, the Clean Power Plan remains killed and the fossil fuel companies remain immune from climate damages. Sound far fetched? Well, here’s what happened with the US federal Comprehensive Environmental Response, Compensation, and Liability Act (CERCLA), commonly known as Superfund, enacted by Congress on December 11, 1980. This law provided two systems for making sure that sites contaminated with hazardous substances were cleaned up without public expense. First, it provided for strict, and joint and several liability for anyone or any entity (responsible parties) that disposed of hazardous substances if those substances were released into the environment, regardless of the volume of wastes or the care taken by the responsible party. Second, CERCLA created a tax on the petroleum industries and others reflecting the polluter pays principal. This tax revenue was the source for the “superfund” that was used to pay for the cleanup of sites where no responsible party could be found or where recalcitrant responsible parties refused to pay for the cleanup. Over first five years, $1.6 billion was collected for cleaning up abandoned or uncontrolled hazardous waste sites. 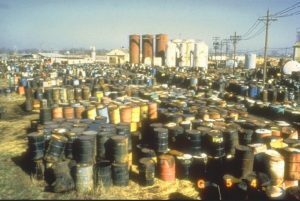 The usefulness of the Superfund structure is that the governments can demand all responsible parties at a site clean it up, under governmental supervision, and if they refuse, the government can proceed to clean up the site using Superfund monies, and then sue all the companies to recover those Superfund costs. As a result, the site gets cleaned up as soon as possible and the responsible parties become liable for whatever the government spends. There were very few defenses available under CERCLA, but one did exclude liability for “petroleum” substances. An argument for excluding “petroleum” substances from CERCLA liability was that the petroleum industry was paying for cleanups through the tax and therefore should be exempt from further obligation to fund cleanups. What happened, however, was that the Republican Congress, in 1995, under Newt Gingrich, refused to renew the Superfund taxes and the fund began to dry up, and remains inadequate today for hazardous substance cleanups. As a result, the tax on the petroleum industry to fund CERCLA was eliminated. Yet the liability exclusion for petroleum remained in effect resulting in a significant protection for the fossil fuel industry against the onerous liability provisions of CERCLA. As we noted, a similar result could unfold through the proposed carbon tax plan. If passed, the fossil fuel companies would get immunity for damages caused by climate change, and no more regulation from a future EPA on carbon emissions. Then in a few years, with a Republican controlled Congress, the carbon tax could be reduced to an inconsequential amount, say $5 a ton, with no changes to the repeal and immunity provisions. While the success of the current lawsuits against the fossil fuel companies remains uncertain, the companies are well aware of the history of litigation against the tobacco industry which failed at first but which eventually gained support within the courts and then the public. Fossil fuel companies have every right to be worried that what happened to sales and consumption of cigarettes may happen with sales and consumption of oil and gas. The impending demise of coal is the canary in the cage. Moreover, the movement for divestment of stock in fossil fuel companies, most notably Ireland’s decision to divest, is sending all sorts of market signals. The fossil fuel industry is getting those signals, and it will fight back.